Since we seem to have touched the edges of this topic in other threads here, I thought it might well be worthwhile to hash and rehash just what "Munitions Grade Armour" is. Obviously the biggest stash of munitions grade armour is Graz, but they also have a fair amount of what can only be called custom, made-to-order armour housed there too. Makes for an excellent comparison if nothing else. I'll post the links to pictures from other recent threads for the puropse of comparison. At any rate, I would welcome a good discussion on just what DOES rate being classified as "munitions grade armour"? Is it simply "issue" armour, or only the low-grade soldier-proof stuff that somehow survived the intervening years, since obviously there are some VERY nice pieces of "issue" armour still extant. I invite your comments, and better yet your pictures. A good question and a huge subject ! To my understanding of it munition armour is simply standard issue armour for the rank and file, it does not in any way suggest that it is low quality, it usually wasnt. Obviously as you say Graz is the repository of the best collection of this type of armour, but The Royal Armouries also possesses a lot of it too, the ' Toiras' cuirasses and pots spring to mind.They are fine pieces of armour in their own right, forged with great skill and care. The possible exceptions to the 'skill and care' that I mentioned above were, unfortunately, from England during the Civil wars of the mid 1640's, when it seemed that anyone who could wield a hammer was at some point churning out helmets and cuirasses which accounts for the wide variation in quality ( though it probably applies to any country in times of war, the swords carried by the Japanese officers during WWII for example). However, after the civil strife was over the quality returned to normal and again some very fine quality 'munition' armour was again produced, unfortunately all too late as armour was quickly dispensed with within a very short period of time. But the beautiful pikemans corselets with all their wonderful decoration and fluting, decorative rivets etc. is munition armour ! Most of the munitions armour was in fact produced in peacetime - in case of war, they had a little more time to spend on it. It is worth noting here , especially in the light of another discussion that is going on in another thread, that the 'munition' armour made and delivered to the armouries both before and after the civil war had to be made by guild members, The London Armourers Guild for instance, all products were stamped with the guildmark ( a crowned 'A' for example ), that showed that the items met the guilds required standards and that the armourer, say Thomas Keene was a time served member of that guild - it implies quality ! The guilds also oversaw the apprenticeships and training of armourers, so that at all times the work was quality controlled to use the modern parlance. And penalties for breaking these codes and laws were severe. The only armourer who seems to have flouted these laws and regulations was Pfeffenhauser, but that is another story ! Even the Royal workshops at Greenwich were not above these rules and regulations ! The Missaglias made vast amounts of munition armour and I think that much of what we see today from the Missaglia workshops is, with the exception of the fine named and dated harness whose original owners are known to us - the Vaudray and the Friedrich I harnesses in the KHM, Vienna for example, probably what they made as munition armour. 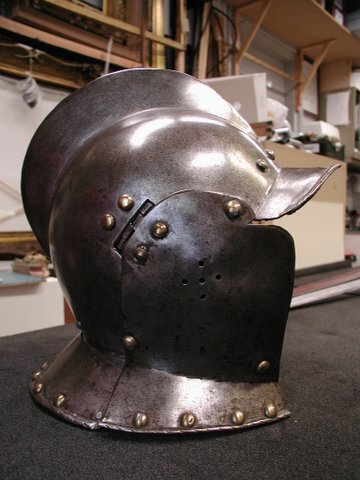 There are for example lots of sallets around, all very much the same and which to our modern eyes are typically Milanese, possibly much of this is munition armour - quality, but mass produced. Anton Pfeffenhauser too supplied quantities of it, they would not let their names be sullied by sending out cheap and nasty poor quality products. This has been written after I have been up working all night ! so my apologies if it at times seems a bit disjointed, it is very much of the top of my head, but I can if required find the relevant sources for the information contained here. One to interesting question is how representative the munitions armour preserved at Graz and the Royal Armouries is of the type? How were the pieces selected for preservation? The Landes-Zeughaus held an enormous amount of arms&armour much of which has not been preserved. IMHO there would be a bias towards preserving the high quality armour while getting rid of the low quality suits and parts. Much of the munitions armour at Graz seems to be cavalry armour to judge by the pictures I've seen which means that they were at least one notch above they stuff issued to the infantry in basic quality (cavalry armour was supposed to be shot-proof as standard, infantry armour was not if I'm allowed to simplify a bit). The Graz armours identified as infantry issue I've seen in phots from Graz so far seems to be officer&nco's issue, not rank and file suits. Compare them to the "Almain rivet" armours preserved in for example the UK and to me at least one sees significant differences in the quality of the armours. "I have searched through them four times and have not got no more than 197 [good] items....They are not polished, not filed either and [there is] not oneharness that does not have flaws and some holes, and around the neck [is) so sharp that one may rip asunder both clothes and hands; and they have such poor leather [straps], that if one bends the leather a little it comes off, and the [black] colour is so badly finished that it looks like pitch and there is not a single helmet that is made according to my proof.."
Inspectors report to Gustavus Adolphus concering a batch of cavalry armour delivered by Louis De Geer in 1632. Looking at the inventory lists and account books there seems to be clear differences between items that at first glance appear to be similar. For example in the 1620s a set of back-and-breastplates issued to a Light Horseman cost 6 riksdaler (5 Swedish rdr=£1 at the time) while the back-and-breast plates issued as part of a cuirassiers 3/4-armour cost 14 riksdaler. (the entire 3/4-armour cost 40 rdr) Something increased the cost of the later set significantly. One possible difference is that the demand that the Light Horseman's backplate had to be shot-proof was dropped at that time. 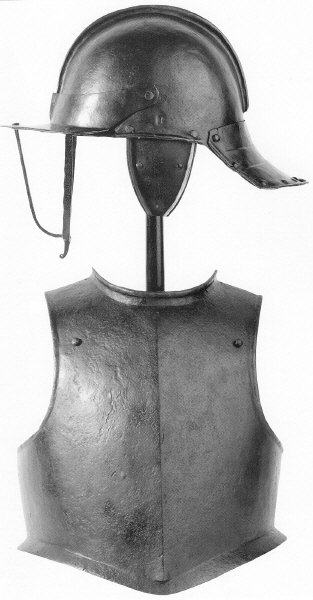 A pikemans back-and-breast plates including tassets cost 5 riksdaler. I do not know that the pieces were selected for preservation as such, it is more a case that they are simply still there ! The same can also be said possibly of Schloss Churburg if you look at some of the pictures of the armoury about 100 years or so ago, it was simpy somewhere to put it ! But preservation is a different thing I think. 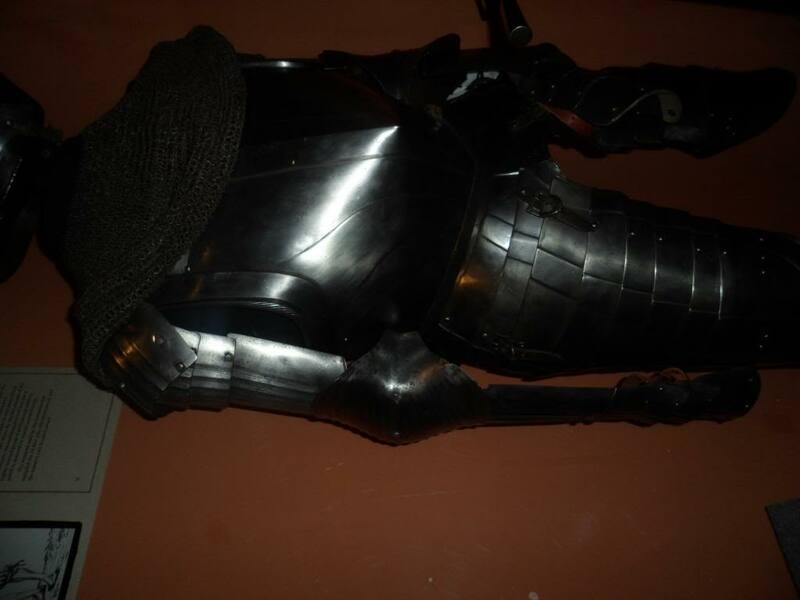 Certainly, some armour was removed from the Tower and re made into other things , though the specifics escape me at the moment, but I can look them up later on. The Tower was the main dumping ground if you like for out of date and unused arms and armour.There have been sales and of course the disasterous fire of 1841(? ), when the Grand Storehouse burned down, and much was lost, but other than that much of the weapons and armour is still there in store. So too I believe with Graz. According to a source that I have (P.Krenn), they still have weapons and armour in store there for some 13000 people, of course covering a time span. Certainly there are armours at Graz, good and serviceable, but devoid of any decoration whatsoever, but there are also others delivered more or less at the same time, possibly by their own armourers, that were nicely roped and finished, in some cases even polished . But I have never seen any that were of poor quality, corners must have been cut certainly, but within acceptable boundries. It is late and I am off to bed now to do some thinking ! My apologies if this post again reads a little disjointed. As I understand it Graz was selected for preservation by the Empress Maria Theresa when she abolished the other Austrian armouries in 1749. At it's height the Laneszeughaus had contained some 185.700 objetcs, today it has a collection of some 33.000 objects if I'm informed correctly. If this is right a lot of items have been lost or discarded. Pichler&Meran's book from 1880 might hold the answer and contains inventory lists from when Graz was in "active service". For exampel the current inventory has some 8000 firearms of which 4000 are pistols, this IMHO is probably not a likely compossition for actual use, there ought to be fare more infantry firearms that the 1:1 ratio which suggests to me that the often finely made pistols were selected for preservation while it's probable that many of the often much cruder muskets and arquebuses used by the infantry was not. The armour described in the report I quoted was the first delivery of a huge order of 8000 new sets of cavalry armour Gustav II Adolf had ordered from De Geer in January 1631. The remaining order was cancelled following this report, exactly why is debated, Brzezinski claims it was due to cavalry armoru having become a low priority by late 1632 since the batch of armour described above was supposedly no worse than that delivered earlier by De Geer. (though he doesn't provide any quotes about this due to the space limitations enforced by Osprey.) I've not gotten to the 1630's in my own research yet but judign by the 1620's doucments I've studied the 1632 delivery by De Geer seems to have been fair bit worse that usual. The New Model Army (NMA) contracts are a fascinating to read and is a very important source thanks to the great detail they provide about the equipment ordered. However they proably represent the exception, not the norm during the ECW since they for the first time put the large resources controlled by Parliament behind a single army which was of limited size. Before that the reality of the equipment issued was always a fair bit diffrent compared to what was ordered. I've never read an description of how well the NMA equipment actualy fullfilled the demands laid down in the orders so I'll have to find the issue you mentioned. As a counter point to the generally well made equipment of the New Model Army let me quote the followinh report from November of 1639 describing the arms&armour available to the english army (mainly that store in the armories of the"Trained Bands") that took to the field for the so called "Bishop's War"
"The foot arms [armour] were old, newly coloured and mostly defective, though [through?] the rottenness of the leathers and buckles and many so thin and slight as to be no way serviceable. The muskets have odl barrels newly patched up and ill stocked, of divers bores wholly unserviceable. Some of the armourers averred that divers of the arms were known by their marks to have been issued out of the armoury some 15 or 16 years since. Many of the pikes were fir wood, with little older bodkin heads, others of ash with broader heads but not serviceable. The bandoleers if worse may be, are worst of all. The musket stocks are generally of of fir-wood and very short. Touching the horsemen's arms, we fidn the breasts by their heaviness to be part carbine, the rest pistol-proof. The back too light and thin for the heaviness of the breast, we conjecture that some of them have been old backs to foot arms [armours]. the leathers rotten, buckles weak, pots very old, thin and old fashioned as the back and breast. The pistols are to short, slightly wrought, of several borse and we suspect will not endure proof." Do note that the statutes laid down for the arms&armour of the English 'Trained Bands' were just as demanding on paper as those of the NMA but clearly the end result was very diffrent. I agree on the picture issue, for eample the Brassey's book I quote above has a lot of ictures of "eye-candy" pieces that might have been used by officers ratehr than the kinds of equipment belonging to the rank and file. Of course this i soemwhat balanced by the use of re-enactors and well made drawings to illustrated a lot of equipment. Cocnerning Graz I was actualy refering to the pictures either posted here or linked to from this site, a lot of them show various types of munitions armour but to my eyes cavalry armour seems to the most common kind. But one probably needs a full inventory list ot make a proper judgement. Or spend a couple of days or weeks at Graz. As I've said before I'm not disputing that a lot of the munitions armour was well made, both surviving examples and the written records clearly show this but IMHO a significant part was of below average quality. In some instances very poor indeed. Both makers and buyers at times cut coners to increase their profits. Unscrouplus Colonels pocket the money intended for arms&armour and bought cheap sub-standard equipment for their men. Some pictures of various armours which probably are "munitions armour", I've tried to select pictures of armorus which to me shows the wide range of quality coverbed by the term "munitions armour". Good topic Gordon. Russ and Daniel, maybe you guys can clear this up I was under the impression that you both are correct regading the quality of the armour produced that is under the heading of "munitions" . I've read several acounts of events like Daniel listed of ordered harness's showing up and being completely unusable due to the extremley shoddy nature of maunfacture( I seem to recall reading something about the court proccedings against a supplier of armour of this sort somewhere) then again there were harness made that were simpley about function, somewhat crude in execution but functionally fine(this seems to a certain extent to have broken down to an infantry vs. cavalry in that generally cavalry armours were made to a little higher quality the pikemans armours covering the wall in the first pages of the Graz book come to mind and then theres the later pic of the row of curassiers armours made by I think Jacob Halder that seem to be a little more cleanly executed) and then a third level of manufacture of what were very well made harness for officers ect. that might even be etched but the etching would be of a stock floral spray pattern or the like. These suits would be very well made and exectued but "off the rack" non the less. How far off am I in my understanding of what "munitions" was? Wow, thank you, Gentlemen, I knew I could count on you guys to put out some really, really good serious research and thought into this subject! Thanks Daniel and Russ! I think that the really good point, and perhaps even the focal point made here is that there was a huge difference between what was ordered and what was on occasion delivered. As noted above, while the written requirements may well have been quite strict, what was delivered by various contractors and accepted by the various inspectors varied greatly. Much was not doubt of high quality, made by reputable contractors and accepted (or not accepted) by reputable inspectors. Much was however made by questionable contractors and accepted by less than reputable inspectors who between them were happy to line their pockets with the differences between cost and payment. (One can find instances of this in virtually all wars, and I suspect that the Roman archives list contractors who were taken to court for poorly made sandals, just like those from the American Civil War who supplied shoddy shoes.) And just like items remaining from the American Civil War, one needs to check the differences between what was made, purchased and issued, and what remains for us to compare it all to. It's doubtful that the junk survived long, issued or not. One would suspect that much of the poorly made armour became the gist for the tinker's art, and was recycled into pots and pans before many years had passed... I am also reminded of the note in ffolkes of the "X pounds of armour and old iron sold for scrap" from Oxford University in the 1880's. So even plenty of the good stuff had a difficult time surviving parsimony and scrap drives. I suspect that Allan's comments on the three basic levels of "issue" are apropos;though I would amend it to being: that there was the junk that was occasionally purchased out of necessity that wasn't up to the standards outlined by the authorities (and hopefully it was sold off as scrap as soon as possible thereafter); the armour that was purchased and was issued but wasn't exactly great stuff, but it worked; and then the actual decent armour from reputable contractors, properly inspected and accepted, that was kept around because it was good, solid armour that was worthy of being issued again. I think that Officers were pretty much expected to acquire their own arms and equipment from their personal resources, though they could choose to purchase from issue grades if they so chose to do. A friend was recently touring the back rooms of the Wallace Collection, and when he asked about munitions grade armour, the fellow showing them around said "THIS is Munitions Armour!" and handed them a VERY nice piece, but it was blackened and still had rough hammer marks from the shop. Still, a perfectly good armour in all ways other than polish. However, I suspect that there were, as I note, MANY different grades of same to be found in the armies of the day. Thanks again for so much great info! Please, more quotes and pictures! Isn't the first pic you posted an "Almain Rivet"? Does anyone know more about Almain Rivet corslets? Are there any good books out there that provide good information on them? Anyone know what "the old Alman fashion" actually means in the second paragraph below? 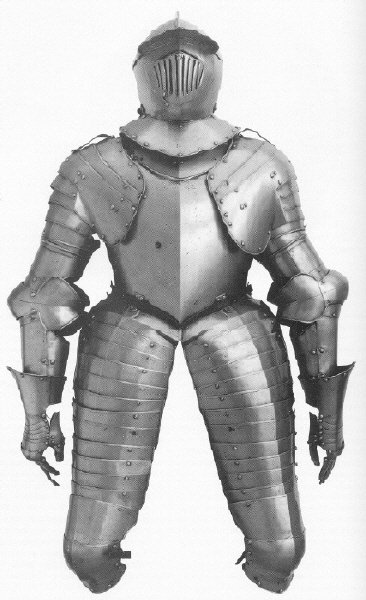 Almain Rivet: A munition-grade half-armour or corslet originally introduced in Germany in the early 16th Century, eventually finding its way into most of western Europe. I assume that "old Alman fashion" simply means the use of those sliding rivets that the Germans favored. I was looking at the images here and some on the internet, and I have to ask how do you get the finish like that on the Graz armours ? 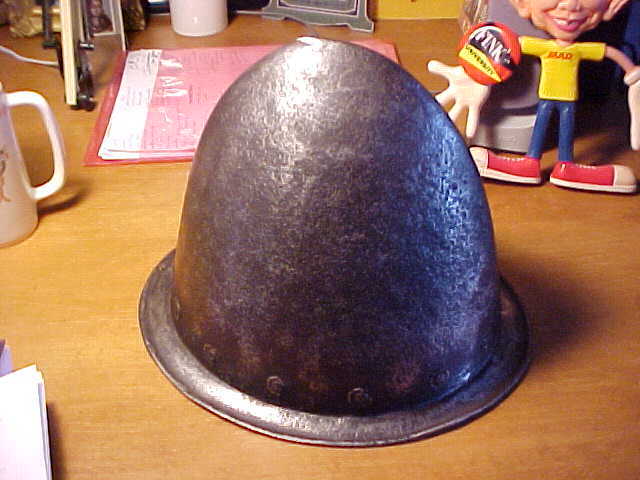 I have seen other munitions armour but it has a polished finish (as per the preceding thread). What exactly means "old Alman fashion" in details? What is the provenance of it? 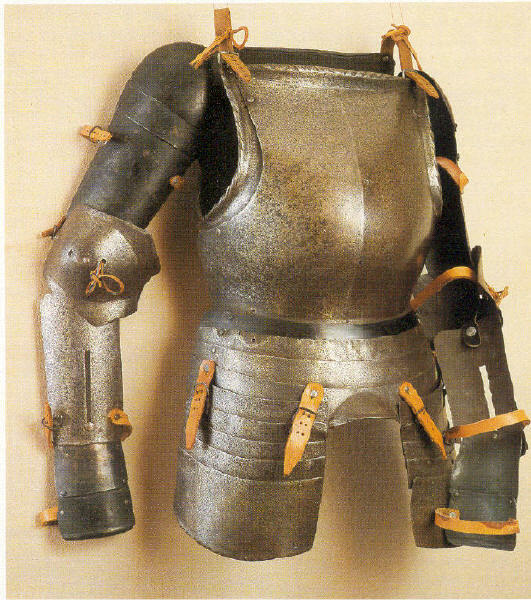 To the famous City of Winchester armour, compare this harness said to be German work of about the year 1540. It consists of an open-faced burgonet, standard, cuirass with tassets, and splints for the arm. Its a simple design, but the arms have more plates than their counterparts in the Winchester armour, and everything is carefully fluted and polished. Its on display in the Glenbow Museum, Calgary AB, Canada. No catalogue number is given.